I was driving through Barrington along Cuba Road today when a bright wooden road sign caught my eye. It was handwritten, ripe-tomato red and it was calling my name. From Cuba, I turned North on Harbor. When I came to street called Henry, there was another sign pointing to the left, so I obeyed, curious to see where this sunny-day detour would take me. I passed several homes and found what I was looking for. 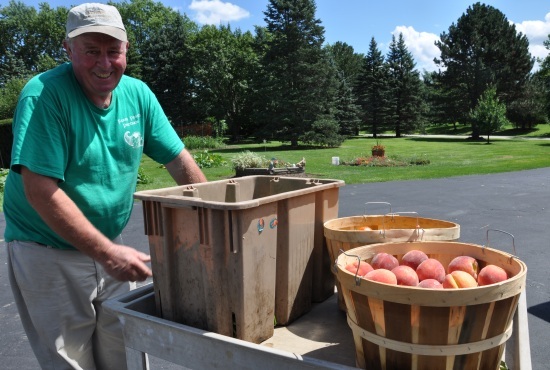 A drive-up farmstand on a private family property and the farmer in charge, Stephen Foley. The Foley family bought the property from an uncle back when it was a neighborhood apple orchard twenty years ago. Today, it’s a garden, with a reputation for producing some of the freshest and most delicious home-grown produce in town. 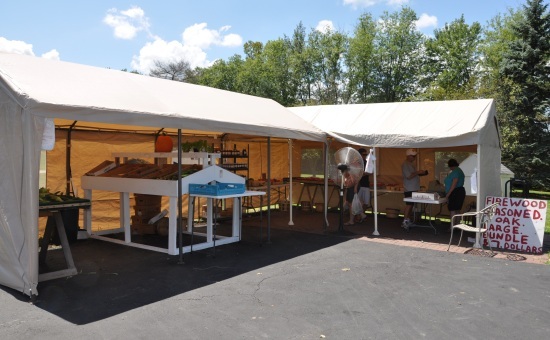 If you come to The Foley Farmstand, you’ll find a rainbow of fruit, green beans, cucumbers, juicy tomatoes and sweet corn worth making a special trip for. In fact, while I was there, I met a shopper on her first trip to the Foley Farm. 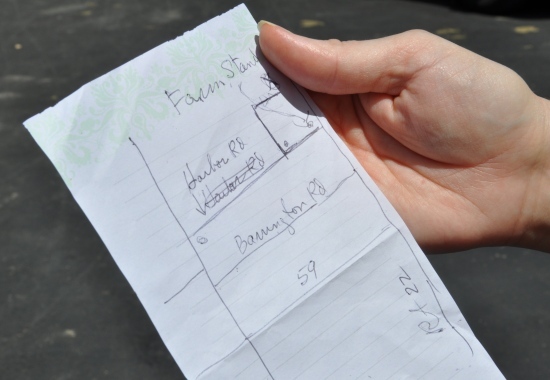 To find it, she followed a hand-written map that her friend scratched on a memo pad. Catherine Savage says, when your friend likes something so much that she draws a map to help you find it, you know it’s got to be good! 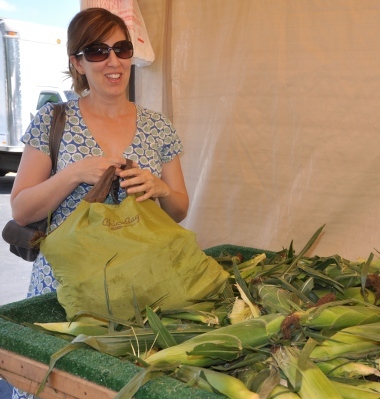 The word on the streets is that the Foley’s sweet corn is some of the best around. The Foleys have been selling produce grown at their family home for the past fourteen years. 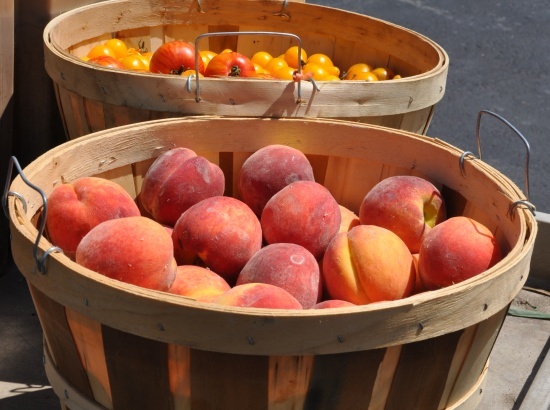 They also stock their farmstand with fresh Michigan peaches, blueberries and Honeycrisp apples plus homemade jams, jellies and salsas made at an Amish community in Cortland, Illinois. 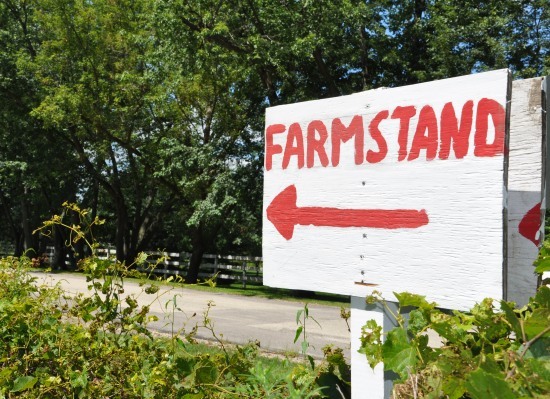 The Foley Farmstand is open seven days a week from 9AM until 6:30PM. Their address is 27270 W. Henry Lane in Barrington and you’ll find it on the map by clicking HERE. They open for business each year on Fourth-of-July weekend and stay open through the end of October. Maureen Foley says we’ve had a lot of heat and a lot of rain “at the wrong time” which has made for a harder growing season, but they’re looking forward to fall at the farm. 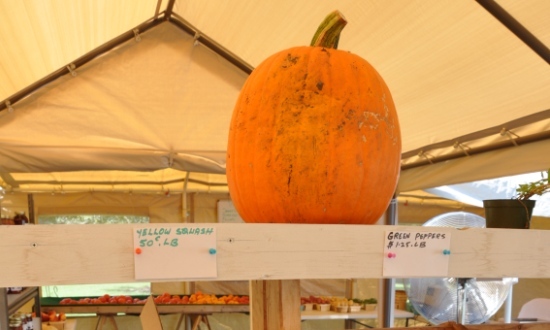 They had the season’s first pumpkin on display today and will have plenty of pumpkins, squashes, gourds and corn stalks to choose from in the coming weeks. Where did the summer go? Prev post 135. Barrington Area Library "Second Fridays"